Gun Studies: Permit Laws Reduce Murders; Red Flag Laws Cut Suicides There's a new push to study the real-life effects of gun laws. "Red Flag" laws lower suicide rates; reductions in homicides are associated with tougher gun permit requirements. Original reporting on the nation's criminal justice system from NPR and member station reporters. In the wake of the Parkland high school massacre, there's been renewed interest in "red flag" laws, which allow courts and police to temporarily remove guns from people perceived to pose a threat. The new research offers insight into the laws' effect — and it may not be what you think. "Although these laws tended to be enacted after mass shooting events, in practice, they tend to be enforced primarily for suicide prevention," says Aaron Kivisto, a clinical psychologist with the University of Indianapolis who studies gun violence prevention. He's completed a new study of the effect of red flag laws in Connecticut and Indiana, two states that have had such laws on the books the longest. "In Indiana, for example, there have been some years where 80 percent of all gun seizures have been due to a concern for suicide rather than homicide or domestic violence reasons," he said. And his research suggests it's working. "In Indiana, after the enactment of the law [in 2005], we saw a 7.5 percent decrease in firearms suicides in the 10 years that followed," Kivisto said. "We didn't see any notable increase or decrease in non-firearms suicide." He says the picture is more "nuanced" in Connecticut, which passed a red flag law in 1999. He says there was little effect in the first few years — just a 1.6 percent decrease in gun suicides — but he thinks that's because the law wasn't enforced much at first. After the Virginia Tech shootings of 2007, he says enforcement increased dramatically. "And so when we looked at it from 2007 and beyond, [gun suicides] decreased by 13.7 percent," Kivisto said. Other states with red flag laws include Washington and California, though they're too recent to be part of Kivisto's study. About 20 states are considering similar legislation, and Rhode Island approved a red flag law just last week. There are no good studies yet of how red flag laws affect murder rates, though at least one is in the works. Gun permit laws, on the other hand, do seem to have an effect on murder — according to another new study. 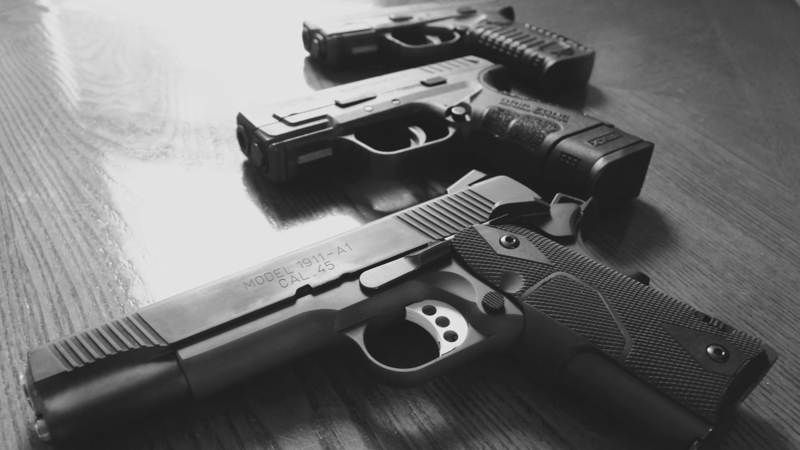 "Requiring handgun purchasers to obtain a license prior to purchase was associated with a 14 percent reduction in firearm homicide," says Cassandra Crifasi, at the Center for Gun Policy and Research at the Johns Hopkins Bloomberg School of Public Health. Her newest research looks at how state gun laws affect the incidence of homicide in large urban areas. "There are lots of conversations right now about gun policies that are effective at reducing violence," she said, "and this study adds to a fairly robust and growing body of literature showing that requiring prospective handgun purchasers to obtain a license is one of the best policies to reduce violence." It's not clear why a license requirement reduces the firearms murder rate. Crifasi says it may be attributable in part to the fact that higher bureaucratic barriers in acquiring guns may reduce the number in circulation — which means fewer are available to be stolen from homes and cars. But she says higher homicide rates in urban areas are also associated with a state's adoption of "stand-your-ground laws," which allow greater legal cover for people to defend themselves with firearms. "In counties in states with right-to-carry laws and stand-your-ground laws, we saw increases in firearm homicide," Crifasi says. One aspect of state gun laws that still needs study, she says, is the effect of differing requirements to obtain a concealed carry permit. Some states, such as Texas, demand training and testing, while others, such as Washington state, don't. "Gun policy people have tended to lump these right-to-carry states together," she says. "But training standards are very, very different across states. So our next steps in our research is to parse out if there are elements of concealed carry laws that are effective or maybe protective against firearm violence, compared to others."